A ruggedly constructed, open frame tape which allows for any on-site debris to be removed during cleaning. The ergonomic pistol hand grip offers comfort during use, in particular, when pacing out. 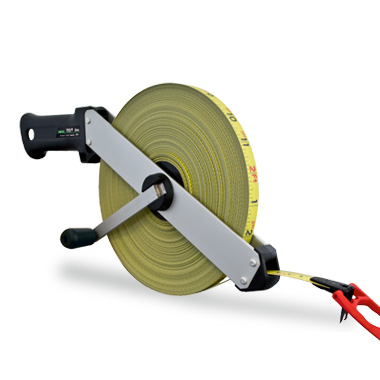 The Tracker can be offered with either ‘Tough Coat’ nylon coated steel, ‘Matt Coat’ polyester coated steel or Stainless steel* blades, all of which are manufactured from premium steel, accurate to EC Class II. 13mm ‘Tough Coat’ nylon coated steel, ‘Matt Coat’ polyester coated steel or Stainless steel blade, accurate to EC Class II. Corrosion resistant aluminium frame with ABS pistol hand grip. Long winding lever and easy-grip knob makes rewinding fast and effective. *Stainless steel blades and dipping tapes with plumb bobs are available on request, subject to availability.